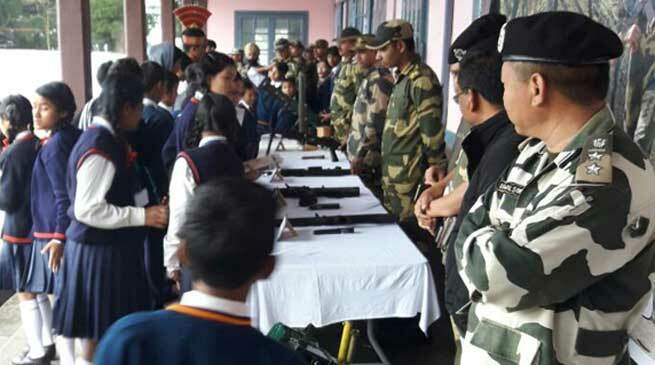 The Border Security Force, in order to create awareness about the ‘Sentinels of Borders’ amongst the school children in Meghalaya, organised outreach programmes at Khliehriat and Byndihati, East Jaintia Hills district of Meghalaya. On Tuesday, the interactive session included topics like history of BSF, raising, functions, work spheres, challenges faced by BSF, contribution in nation building etc. Appx. 550 students from Donbosco School, St. Anthony College, St. Ambrost School, Sacred Heart Secondary School Byndihati and Byndihati Secondary School witnessed the programme. Next day, two similar programmes were again conducted by BSF Sector Headquarter Jowai at Mariam Hill Secondary School, Jowai and Nongtalang. Wherein in the first programme appx 300 students from Mariam Hill Secondary School, St. Mary Mazzerello Secondary School and North Liberty Secondary School including Liberty Secondary School, Teaching Staff witnessed the programme. At Govt College Nongtalang of West Jaintia Hills district of Meghalaya, appx. 200 students from Govt. Secondary School Nongtalang were present in the programme. During the programme, a large display of the weapons and artillery being used by BSF during training and at borders also shown to the students. The students were also shown, a small documentary prepared by the BSF. The BSF Officers shared their experiences with the students and motivated them to join BSF and serve the nation.